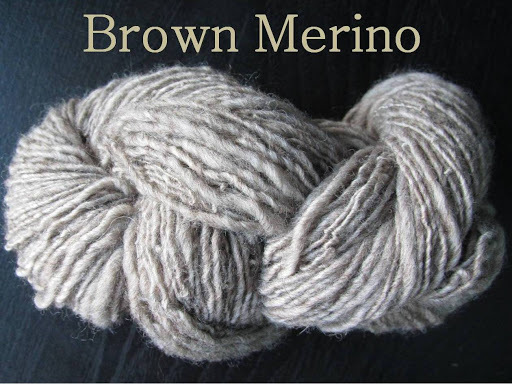 As you might image, the Merino wool made a lovely, soft, and squishy single. If I had plied this, the resulting yarn would’ve displayed a lot of elasticity and bounce, which is characteristic of the fine crimp pattern in Merino staples. Its elasticity is one reason why Merino wool is so loved for fabrics and for socks in particular. However, the fiber’s fineness works against it for socks, making it prone to pilling and wear, as seen in the pile of socks waiting to be mended. However, for me, the bounce and softness of Merino is worth a few minutes of darning every now and then. Onto the next breed! We took a brief look at Romney wool when I described the For the Love of Longwools class I took at Rhinebeck. Now, we’ll dig a little deeper. This handsome devil’s photo came from Wikipedia. The Romney sheep is a dual-purpose meat and fiber breed that is grouped with the English Longwool Family in the Fleece and Fiber Sourcebook. It was developed from crossing a breed native to the Ronney Marsh coastal plain in southeast England with longwool Leicester bloodlines. 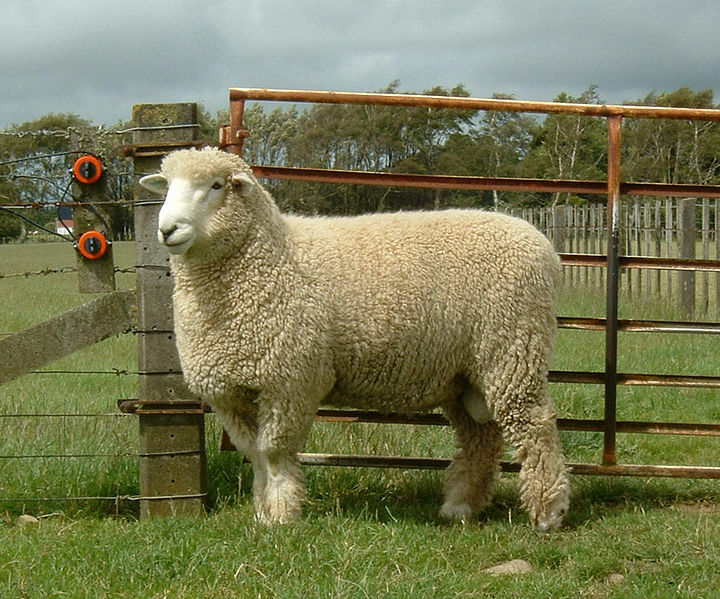 This imparted a long staple length and luster to Romney fiber, while still maintaining the breed’s unique adaptations allowing the growth of quality wool in boggy, marshy environments. According to the FFSB, “Romney fleece is most likely to be voted president of the Wool High School senior class. It can’t do everything, but it’s an all-around good citizen and extremely versatile, with personality and charisma. It’s a classic.” Romney fiber can range in quality and fineness depending on the particular sheep and location (North American and British are somewhat finer than New Zealand Romneys), but in general it ranges from coarse to fairly fine (micron count 29-37) and is usually finer than other longwool breeds (but you still might not want to wear it near sensitive skin). I am enjoying this bit of Romney I am spinning much better than the first Romney I tried during the longwools class. This is perhaps due to the preparation (carded roving vs. commercial combed top) but it could just be nicer fiber. This bunch is drafting very smoothly and creating a strong-feeling, even single. 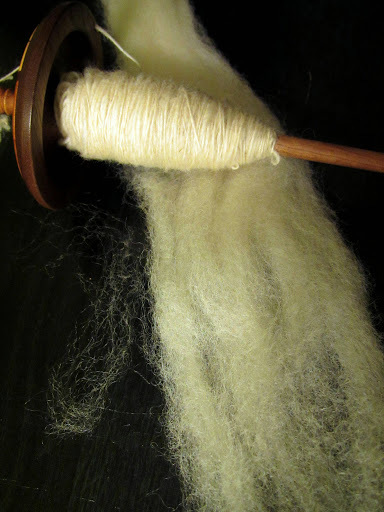 The roving I am spinning here is from Alder Brook Romneys in Connecticut. A friend of the Fiasco’s also raises Romneys, shears them herself, and sells handspun yarn from her flock in her Falling Star Fibers Etsy shop. I purchased some fiber from her at a festival that I still have stashed but I’m tempted to skip ahead and just buy some of the lovely finished yarns she has in her shop! Have you used Romney fiber/yarn? What did you think of it? Romney was the first wool I played with when we moved to Michigan – there was a farm nearby and I remember my husband gave me three pounds of roving for Christmas that year . I mostly made socks with it but also two little sweaters for my son. This was BR (before Ravelry) so not many photos of those long ago projects. 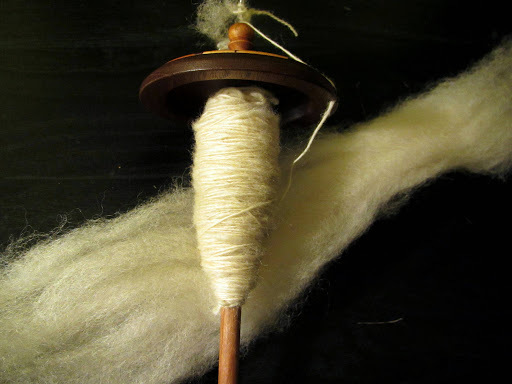 The folks on the farm moved and there are so many yummy fibers out there I haven't tried Romney since – but I do remember I enjoyed spinning every inch of that three pounds. I'm working through a Romney fleece at the moment, my first experience with the breed. I'm loving all the different things it can do – spun chunky and tightly plied for a bouncy, lustrous yarn, spun finely three-ply for sock yarn (I bet it will wear like iron), spun even finer 2-ply for lace – I can't wait to begin knitting with them.